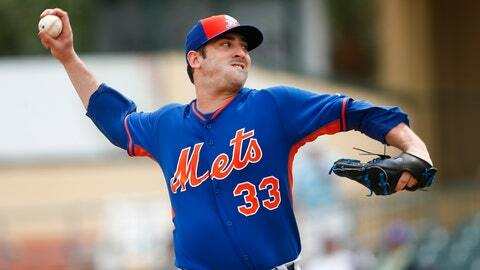 Matt Harvey has thrown 202 innings in his first season since returning from Tommy John surgery. Matt Harvey has already surpassed his initial innings limit of 180, but he reportedly has a contingency plan in place in the event that his workload affects the future of his career. According to CBS Sports, Harvey’s agent, Scott Boras, purchased an insurance policy on the 26-year-old right-hander’s arm at the end of the regular season. While there was some confusion between Boras, Harvey, and the Mets as to the plan for Harvey’s usage in his first season returning from Tommy John surgery, Harvey pitched 189 1/3 innings in the regular season, exceeding the debated 180-inning benchmark. As the Mets’ magical postseason run continues, Harvey has thrown 12 2/3 innings over two starts, bumping his annual total to 202 innings. CBS Sports reports that the amount Harvey is insured for is unknown but that his policy is "a two-tiered type, with a certain payout if there’s a loss of earnings based on a slippage of performance, and a different payout if his promising career ends early." Harvey has won both of his starts this postseason, posting a 2.84 ERA with 16 strikeouts and four walks in 12 2/3 innings in Game 3 of the NLDS against the Los Angeles Dodgers and Game 1 of the ongoing NLCS versus the Chicago Cubs.